It hasn’t been that long since GSC brought Dolby Atmos surround sound system to Malaysia, now they’ve invested around RM500,000 to offer a new cinematic experience for moviegoers: the D-BOX. It kind of sounds wrong (it’s my D in a box~) and it has a lot to do with vibration (oooh my~) but what it really is almost completes what some may call a full 4D movie experience. GSC has turned part of its cinema halls into “Motion Master” with D-BOX’s technology. Basically, the D-BOX seats move according to the action of the movie. Car in the film turns right, the seats moves slightly to the right. Car in the film crashes, the seats vibrate hard. Needless to say, it can be really impactful and immersive watching a movie with it. If you’re a Sony Playstation Dual Shock controller fan, you’d know what I mean. So if you’re watching a 3D movie with D-BOX seats activated and surrounded by Dolby Atmos audio technology, you’re pretty much getting a complete 4D cinematic experience. During the soft launch on Monday (4 August), a few sample clips were shown just to show what the seats can do and I have to say it’s really impressive, especially for those thrilling car chase scenes in these action flicks. The intensity of the seat’s movements can be conveniently adjusted to your comfort (or switched off) with the buttons at the side of the seat like a massage chair. The movements of the seats are so precisely synchronised to what’s shown and heard from the film to a point that it could actually make the physics flaws of a movie scene or sequence more obvious and noticeable to the viewers (e.g. ; the fuel tank robbery scene at the beginning of Fast & Furious). A short F-1 footage was shown as well and I really felt like I was driving the vehicle, shifting gears and going up and down the turning platforms (or whatever you call them). By the way, the seats are pretty comfy as well. The full film of Guardians of the Galaxy was shown in complete D-BOX viewing and from that, I find that it’s probably not fantastic for every movie title. Just like how not every 3D viewing of movies is awesome. Guardians of the Galaxy is more of an outer space sci-fi action flick with most of its action jumping, shooting and flying aircrafts around, therefore the seats sort of constantly vibrated practically the whole movie and because of that, I’ve gotten so used it halfway through that I didn’t feel the impact of the seats anymore. Perhaps I would’ve felt that something is missing if the seats were suddenly switched off. I strongly believe the seats may be more powerful and fun to experience if it was for movies that have more relatable thrilling action sequences. Like maybe, for example, Into the Storm. 30 D-BOX seats (model: Paragon 538 by Ferco) are now available at GSC 1 Utama (Hall 3). 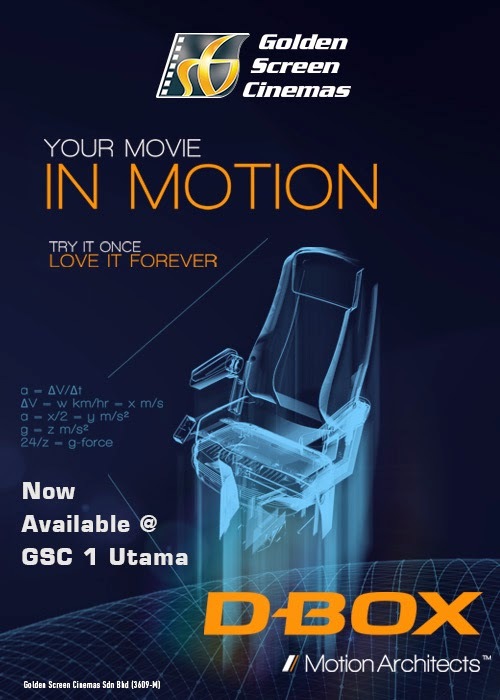 Tickets for movies in D-BOX and Dolby Atmos format at GSC 1 Utama will be priced at RM32.00, an additional RM5.00 surcharge will be applicable if the movie is in 3D digital format (you can refer to the ticket price list at www.gsc.com.my). GSC D-BOX seats will be extended to GSC Mid Valley (27 seats) and GSC Pavilion KL (29 seats) by year end 2014. Although the seats do not make harsh turns at all directions like the 4-D or Motion Master-like rides at the theme parks, it is still advisable to go through the safety guidelines before buying the tickets. It may harm or cause injury and is not suitable for pregnant ladies, elderly, heart conditions, back problems, etc.